When you’re looking to buy “Used Dodge Cars For Sale In Apache Junction” In-Power Motors 2, LLC offers the best used car buying experience in the area. We carry a wide selection of used Dodge cars in Apache Junction, AZ. Dodge cars are one of Arizona’s favorite domestic choices. The Dodge motor company was originally founded in the 1900’s by two brothers named John and Horace Dodge. In the beginning, John & Horace produced chassis components and precision engine manufacturing for Olds Motor Works and Ford companies. Currently Dodge is a major part of the Fiat Chrysler Automobile (FCA Group) family and markets a wide range of passenger vehicles. Dodge is also famous for their SRT performance division . If you are searching for a specific used model of Dodge car, give us a call at 480-983-3461 or Stop by In-Power Motors LLC at 2281 Apache Trail, Apache Junction, AZ 85120 today. We have a huge list of 500 down used cars for sale. Dodge is about as American as apple pie or baseball, and American families have been driving them for many years. Dodge enthusiasts know the quality, durability, and highly desirable lineup of cars they offer. In-Power Motors is proud to sell used Dodge vehicles to Apache Junction residents. Dodge offers a variety of options including motor sizes, trim levels, configuration, fuel efficiency and power. To find out which used Dodge cars we currently on our lot have please call us at 480-983-3461, Stop by our dealership or Shop Used Dodge Car Inventory Online. 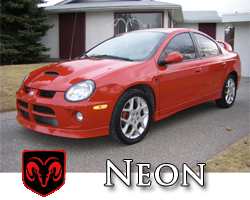 The Dodge Neon has been staple for American motorists since its inception in 1994. The neon was produced with 2 door and 4 door configurations and is marketed all across the United States and in other countries such as Australia, Egypt, Canada, Mexico, Japan, and more. Earlier versions of the Dodge Neon originally only featured 2 options of the 2.0 Liter 4 cylinder engine that had either 131 or 150 hp options. The 2nd generation of the Doge Neon was produced and sold during 1999 – 2005 and these examples came equipped with a 2.0 liter engine. Also available were the R/T or Magnum version which both produced 150 horsepower. The models sold during that time included amenities such as a large 2.4 liter motor, keyless entry, spoilers and other features. The Neon is not currently being sold new in the United States. Although, Dodge plans on relaunching the Neon as a replacement for the Dodge Dart in early 2018. Shop Used Dodge Neon Car Inventory. The Dodge Dart is a nameplate that has roots that go deep into automotive history. The Dart was originally manufactured between 1960’s and the 1970’s and was later reintroduced with updated modern styling in 2012. The newest models of the Dart have a transverse front-engine, feature front wheel drive, and are a 4 door compact sedan. The Dodge Dart comes available with Bluetooth connectivity, 3 options for transmission, obstacle detection, and even blind spot monitoring. The Dart is highly fuel efficient and has a combined driving rating of 40 miles per gallon. Safety features on the Dart include backup camera,electronic stability control, brake assist, traction control, ABS, brake-lock differential, hill-start control, and much more. With 10 airbags, a reactive head restraint system, and other safety features, the Dart keeps its drivers safe. 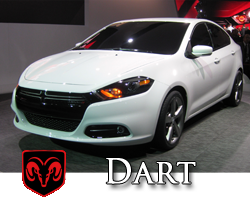 In fact, the Dart has earned a 5 star safety rating by the (IIHS) Insurance Institute for Highway Safety in 2013. Shop Used Dodge Dart Car Inventory. The Dodge Avenger is a popular front wheel drive, mid-sized sedan which was originally produced from 1994-2014. It was offered with both 4 door and 2 door configurations. Different package options gave car buyers a variety of options to meet their needs, wants, and budget. The Coupe model of the Dodge Avenger came equipped with the option of a 2.0 liter inline 4 cylinder motor or a more powerful 2.5 liter V6. They had transmission options of 5 speed manual or 4 speed automatic. The Sedan model of the Avenger was originally introduced in 2007 and only came with the 2.4 liter inline option that which was naturally aspirated. The R/T version of the Avenger were equipped with more powerful engine configurations such as the 2.7 liter V6 in its SXT trim level and the even more powerful 3.5 liter V6. Later models of the Avenger were fitted with a 3.6 Penastar V6 which produced 283 horsepower and came with upgraded suspension that improved handling and ride quality. 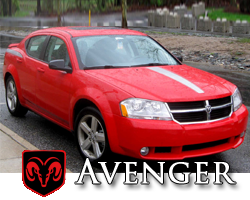 Shop Used Dodge Avenger Car Inventory. The Dodge Stratus was originally introduced in the year 1995, this mid-sized vehicle earned top reviews from Car and Driver Magazine. The Stratus was produced and marketed also under the Serbring brand name by Chrysler. It was produced until 2006 when the Dodge Avenger took its place. Dodge Stratus was actually a replacement for the Dodge Spirit. It quickly became the in-between option of the Breeze and Cirrus. These cars were nearly the exact same automobile minus the wheels, front fascia, taillights and rear bumper. The 2nd generation of the Dodge Stratus was manufactured from 2001-2006 and shared design elements with the Eclipse (Mitsubishi). Engine options included 2 4 cylinder motor options and 1 V6 engine option. 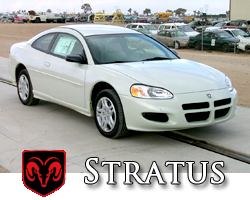 Shop Used Dodge Stratus Car Inventory. The Dodge Charger is known as on the of the major muscle cars in the industry, and is a favorite of many Americans. Dodge started production of the Charger in 1964 with 3 vehicle sizes including the personal luxury coupes, full-sized sedans and the subcompact hatchback. 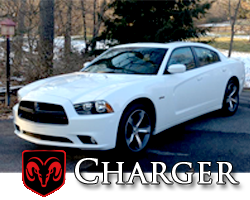 Today’s newer version of the Charger is a high horsepower 4 door sedan. The 6th generation of the Charger was brought back back in 2005. Styling of the Charger is modern retro. It is reminiscent of the 1960’s incarnation of the charger. Dodge stayed true to the Charger nameplate and only offered V6 or V8 motor options. The entry model of the Charger starts with the 3.5 liter V6 engine and 5 speed automatic transmission options, traction control, 17 inch wheels, air conditioning, stability control, remote keyless entry, power windows, power locks, power mirrors and ABS. Other optional upgraded packages include a 6.1 liter V8 Hemi, sunroof, heated seats, rear seat DVD, 322-watt audio, GPS navigation and more. The Dodge Charger retains a lot of its resale value and make the perfect Dodge Used Car. Shop Used Dodge Charger Car Inventory. 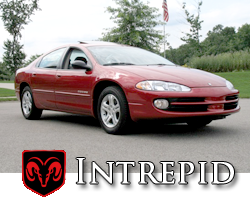 The Dodge Intrepid is a full-sized sedan that features front wheel drive, and only is found in the 4 door configuration. The Intrepid was produced from 1993-2004 and is closely related to the Chrysler 300M. The Intrepid was intended to be a replacement for the old Dodge Monaco. Early versions of the Intrepid which were produced between 1993 to 1997 were available in 2 different trim levels, the base model and the ES model. The ES model featured 4-wheel disc brakes, suspension “touring” , and 16” wheels wrapped with better tires. They also were equipped with driver and passenger side airbags, 4-speed auto transmission, and A/C. Later versions of the Dodge Intrepid were equipped with more powerful V6 motors which could produced 200 to 250 hp. The Intrepid was even used in NASCAR racing until the Dodge Challenger took over in 2006. Shop Used Dodge Intrepid Car Inventory. The Dodge Challenger roots extend back to 1960 when it was originally introduced as an answer to the Chevy Camaro and Ford Mustang. It is a 2 door notchback sedan. About a decade later during the 70’s, the “Road & Track” or R/T was introduced that featured the V8 “Magnum” that was a 6.28 liter engine that produced an incredible 335 HP. They offered a larger motor which produce up to 425 hp to compete with the SS Camaro’s and Mach 1 Mustangs of the time. In 2008, the Challenger was reintroduced with bolder styling and greater styling influence from the original body from the 70’s. The base model of the Challenger was equipped with 3.5 liter V6 motor that produces 250 bhp. The beefed up 5.6 liter Hemi made it’s debut in 2009 and produced up to 372 horsepower. In 2015, the Dodge Hellcat hit the ground running with its 6.2 liter supercharged HEMI engine that cranked out an amazing 707 horsepower and 650 ft lbs of torque. This makes the Challenger an unstoppable force on any road it travels. Most recently Dodge released their ground crushing Dodge Demon, an unmistakable milestone for the brand. The Demon reaches 60 mph in an astronomically fast 2.3 seconds. Making it today’s fastest production car. 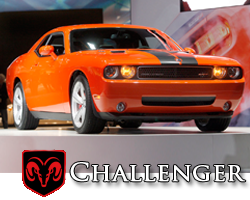 Shop Used Dodge Challenger Car Inventory. 5 Star Used Car Sales Review: “Me and my wife bought a 2009 Dodge nitro last Saturday got good financing through one of their banks. Down payment was fair and my monthly payments are 335. Even better that includes a 2 year warranty. Thank u Pablo and Ricardo” Daniel R.